Fibromyalgia: Is it all in my head? Fibromyalgia is the most common musculoskeletal condition after osteoarthritis. It is often misdiagnosed and misunderstood. Its characteristics include widespread muscle and joint pain and fatigue as well as other symptoms. Fibromyalgia can lead to depression and social isolation. More than 12 million Americans have Fibromyalgia. Most of them are women ranging in age from 25 to 60. Women are 10 times more likely to get this disease than men. Fibromyalgia causes you to ache all over. You may have symptoms of crippling fatigue — even on arising. 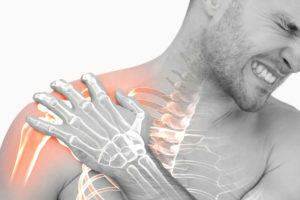 Specific tender points on the body may be painful to touch. You may experience swelling, disturbances in deep-level or restful sleep, and mood disturbances or depression. Your muscles may feel like they have been overworked or pulled. They’ll feel that way even without exercise or another cause. Sometimes, your muscles twitch, burn, or have deep stabbing pain. Fibromyalgia can cause signs and feelings similar to osteoarthritis, bursitis, and tendinitis. Some experts include it in this group of arthritis and related disorders. But the pain of bursitis or tendinitis is localized to a specific area. The feelings of pain and stiffness with Fibromyalgia are widespread. There are no specific laboratory tests to diagnose Fibromyalgia. To make an accurate diagnosis, your doctor will rely on a comprehensive physical exam and your medical history. Fibromyalgia is mostly a diagnosis of exclusion. That means the doctor will rule out other conditions that could cause similar symptoms. Other laboratory tests used to rule out serious illnesses may include Lyme titers, antinuclear antibodies (ANA), rheumatoid factor (RF), erythrocyte (red blood cell) sedimentation rate (ESR), prolactin level, and calcium level. Your doctor will also use a diagnosis of inclusion. That means your doctor will make sure your symptoms satisfy the diagnostic criteria for Fibromyalgia syndrome outlined by the American College of Rheumatology. These criteria include widespread pain that persists for at least three months. Widespread pain refers to pain that occurs in both the right and left sides of the body, both above and below the waist, and in the chest, neck, and mid or lower back. The criteria also include the presence of tender points at various spots on the body. The doctor will evaluate the severity of related symptoms such as fatigue, sleep disturbances, and mood disorders. This will help measure the impact FMS has on your physical and emotional function as well as on your overall health-related quality of life. What is the medical solution? There is no known medical Fibromyalgia cure. And there is no medical treatment that will address all of the Fibromyalgia symptoms. Instead, a wide array of traditional and alternative treatments has been shown to be effective in treating this difficult syndrome. A treatment program may include a combination of medications, exercises — both strengthening and aerobic conditioning — and behavioral techniques. A 2008 study from the Journal of Pain entitled Positional cervical spinal cord compression and Fibromyalgia: a novel co-morbidity with important diagnostic and treatment implications, found that cervical spinal cord irritation was commonly found in patients with fibromyalgia. In addition, a recent 2011 case study in the Journal of Upper Cervical Research showed successful resolution of fibromyalgia symptoms during a period of Upper Cervical chiropractic care. Because of this correlation, many patients with Fibromyalgia have showed tremendous symptomatic relief from Advance Orthogonal care at the Atlas Family Health Center in Columbus, Ohio. The Atlas Family Health Center uses a revolutionary healthcare procedure called the Advance Orthogonal technique. This procedure identifies subtle misalignments of the top vertebrae in the neck, and corrects them using a percussion-wave adjustment. Due to the proximity of these bones to the brain stem area, this procedure can help with a wide variety of conditions, including fibromyalgia. It is so important to find out what is truly causing your fibromyalgia. To learn more about whether Advanced Orthogonal care at the Atlas Family Health Center in Columbus, Ohio. can help you, call us an set up a consultation with one of our doctors.